All right. I'm going to date myself and come clean with my ultimate guilty pleasure at the same time: I'm obsessed with the 90s. Lately I've been thinking about how the heavily used 90s phrase "sell out" has nearly vanished from our daily lexicon, and I've been dying for an excuse to talk about it. Luckily Hit So Hard: The Life & Near Death Story of Patty Schemel recently began streaming on Netflix, presenting the quintessential opportunity. Aside from Courtney Love talking with her mouth full while being interviewed and some amateur camera effects that manage to become wildly abundant as the doc goes on, it's a super-raw yet insightful take on the 90s grunge-rock scene. You don't have to be the biggest Hole fan ever to watch this—it's mostly about Schemel's personal struggle with drugs, her relationship with music, and the dysfunctional-family dynamics that often exist in band relationships, peppered with some cool footage of Kurt Cobain, including his last Christmas. 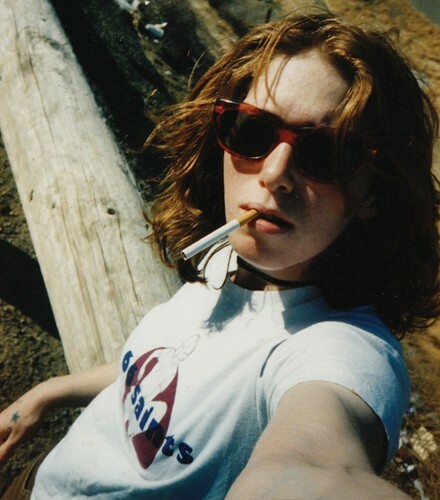 Patty Schemel's a badass drummer, drugs, drugs, music blah blah, Courtney chews on something. Drugs, Kurt Cobain, drugs, Kristen Pfaff, drugs, crazy Hole tour, drugs drugs drugs, Courtney chews. AND THEN. Hole goes into the studio to record their commercial pop album Celebrity Skin. Producer Michael Beinhorn gaslights Schemel and wears her down by making her play her parts over and over again for eight hours a day for TWO AND A HALF WEEKS STRAIGHT before she finally breaks. Then Beinhorn plays Schemel's weakest takes for Courtney and convinces her to bring in some fancy session drummer whom he's secretly had on retainer the whole time. This pretty much drives Schemel directly to Crack Mountain, she quits the band, drugs drugs drugs, rehab, she gets better, plays with dogs. And then Courtney eats another cracker or something. If you were around in the 90s, played in a band, or were a participant in 90s rock culture in any way, this movie serves as a reminder of what the industry was like at the time, and what it was to be a band in the 90s. The underground was real and the underground had clout to a point where people actually used the term "sellout." You didn't want to sell out because that was uncool; even worse, it meant you were betraying your authenticity and you might as well leave your street cred behind in a sad, crumpled-up pile next to your plaid flannel shirt and your duct-taped Vans. Nevermind was Nirvana's sellout album, with In Utero perceived as an attempt to regain said street cred. Celebrity Skin, in all of its intentional glossy commercial-production session-drummer glory, reinforced the warning tale to emerging grunge bands to avoid the wrath of shiny major labels and the lures of mass-market success. In these modern times with the fleeting Internet, the accessibility of digital recording programs, and the traditional model of the music industry basically in shambles, I can't help but ask—is it still possible to sell out? Is that still a thing? Considering our easy access to mass exposure, does a rock underground still exist? Hearing our favorite song in a car commercial once made us cringe a little because it meant our favorite band had joined the ranks of the mainstream; it was no longer "ours." If your band gets a song in a commercial now, it's not considered a sellout, but rather a success. In fact, getting a song anywhere that yields even the tiniest scrap of cash is now considered a success. Bands used to make money by selling albums; now licensing seems to hold the only gold. Given the amount of people making and recording music coupled with our collective Internet-induced short attention span, the rise and fall of a band no longer gets the luxury of three albums. It happens in three months, three days, or better yet, three minutes . . . Millenial translation: that's roughly the length of a YouTube music video.